PR80: thermal printer with automatic cutter. 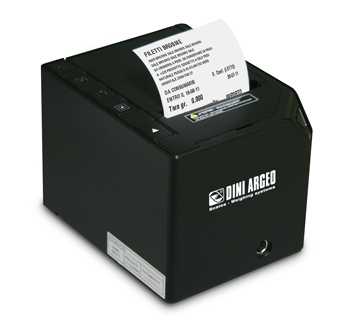 Thermal printer fitted with automatic cutter, features are a compact size and elegant design. Particularly suitable in the industrial sector for the simple replacement of the paper roll, printing speed and robust construction. PR80 Thermal printer with print cutter. RPT80 Thermal paper roll 80m long, 80mm wide. 12mm hole. 77mm external diameter. RPT80C 30 thermal paper rolls 80m long, 80mm wide. 12mm hole. 77mm external diameter.